83 Pound Lake Trout | FISHING FURY - A Fishing Blog with Attitude! 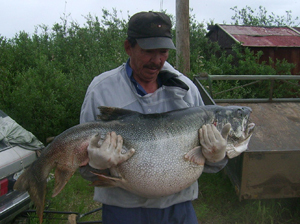 Long time resident of Deline, N.W.T, George Kenny netted himself one hell of a trout. This incredible fish weighed 83lbs (38kg) and despite his best efforts to release the fish, he knew it wasn’t going to make it. For most people a trout like this is a once in a lifetime fish, but for George Kenny, it was just another day at the office. He says he caught a much bigger one last year that he immediately released. It is believed that a trout this size would be around 20 years old! The guy’s arms are gonna pop out of the sockets! Wow, that is a HUGE fish. Biggest I ever caught was 20lbs and I was dam proud of that one. Be fishing for some of these bad boys this September, but average size is around 5-7lbs with big ones in the 20-30lbs range. Thing I’ve noticed with Lakers on the smaller inland lakes up in Canada is they are brutes and a 10lbs will take you for a ride!! Ken i thought you didn’t talk to people that fish for lake trout? only pike? That’s one big trout! I can’t even imagine what a bigger one would look like! !